Haptic Breathing Cues is a meditation program that provides visual and gentle haptic feedback cues for a guided breathing meditation. When the unsecured vibration motor is placed on the body, it bounces on the skin and the resulting feeling was unpleasant and irritating. When the vibration motor is pinched between two fingers, the sensation feels more pleasant and soothing. Setting the delay for both LOW and HIGH to 100 makes the a vibrating sensation that feels like a racing heartbeat when the body is pressing on the motor or pinching the sensor between two fingers. Setting the delay after turning HIGH to 100 and the delay after turning low to 5000, still generates a heartbeat like effect but instead it is more subtle and feels like a light buzz. I tried increasing the delay in the fade code but this felt like the vibration went on too long and made my finger feel weird due to the prolonged vibration. To determine the threshold I reset the fadeAmount to 5 and began by setting the upper limit of the brightness value in the if condition to 100 and this generated a subtle effect. Lowering it to 10 and I couldn’t sense any vibrations. At 50 the sensation was barely noticeable and felt like a bug walking on my skin. At 60 there wasn’t much change. I felt like at 70, the sensation was the easiest to detect without having to concentrate too hard. For this part our group tested a grouping of 3 vibration motors both using modified blink sample code and fade sample code. We tested the motors on the skin and with the body on the sensors where we pinched the sensors between our fingers. 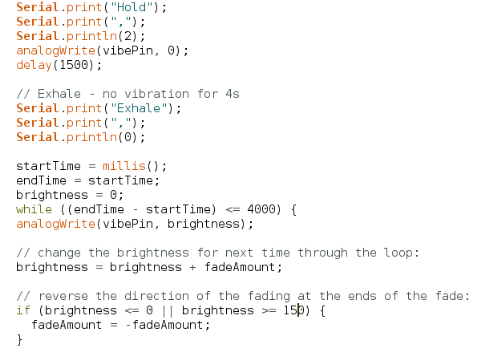 With the blink code, we were able to create a sequence where a motor vibrated one after the other causing a subtle sensation of directional movement. For the haptic drivers i tested the basic and complex code, preferring to pinch the motor between my fingers to feel the sensations. With the basic code, a tingling sensation that seemed to crawl up my arm was felt as the program looped through the 117 possible effects. 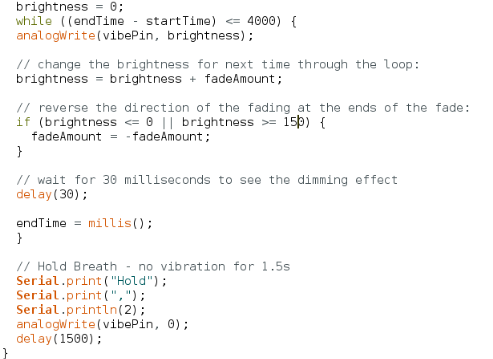 With the complex sample code, I tested a combination of effects and found the vibrations to be too subtle. 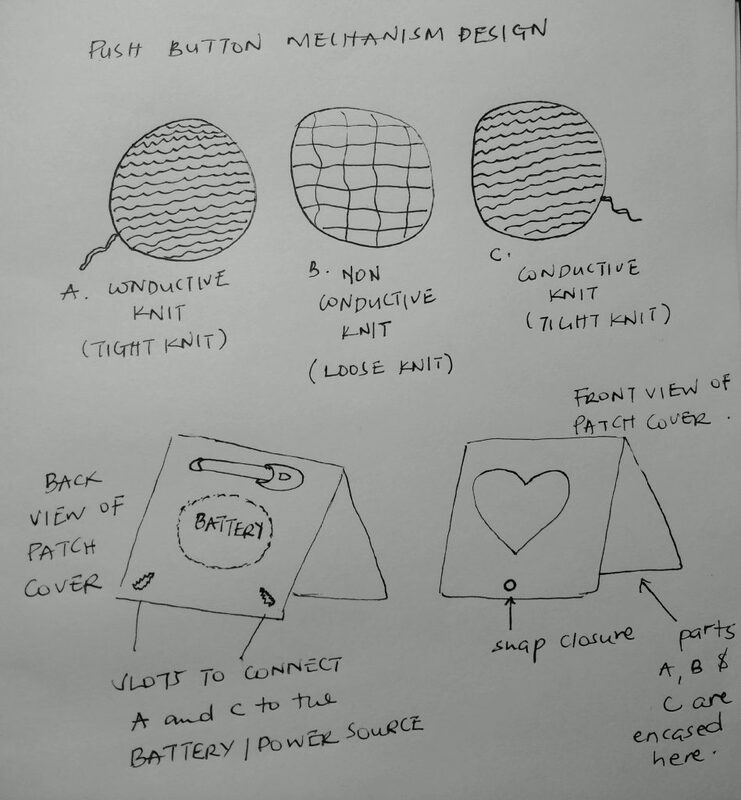 Since I wanted to have the motor sandwiched in fabric/felt material I decided not to use the haptic motor driver. I feel like this driver is more beneficial in cases where you want to create a single interaction and it didn’t work too well for me when trying to mimic a breathing patter or heartbeat effect. 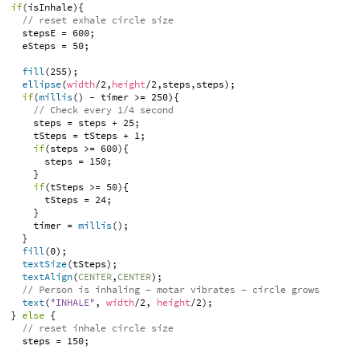 I found that it was simple to use the blink and fade code with the vibration motor on my own to create my haptic breathing cues. 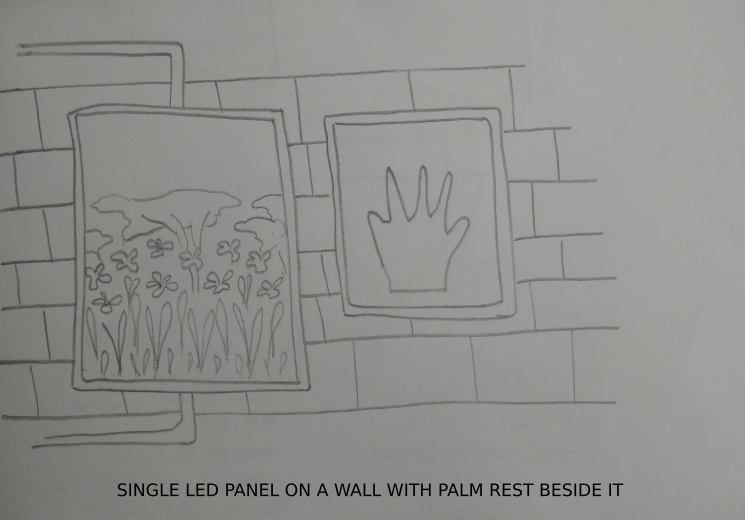 Ideation: I wanted to continue exploring self-care tools and during testing in the haptics workshops I noticed that some of my favorite interactions were when I pinched the vibration sensor between two fingers and was running code that created a heartbeat like sensation. 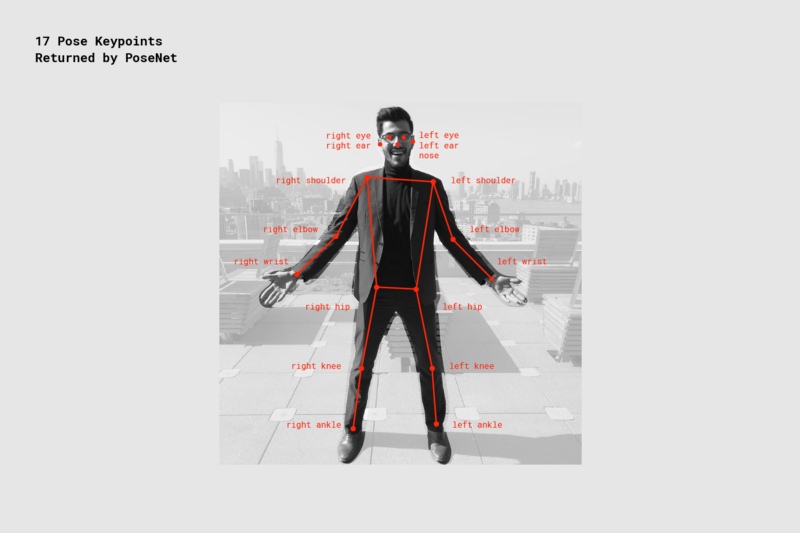 This got me thinking about creating a handheld meditation tool that would incorporate both visual and haptic cues as feedback. To first create the breathing cues – I used a formula for the meditation where a person would inhale for 4 seconds then exhale for 4 seconds. 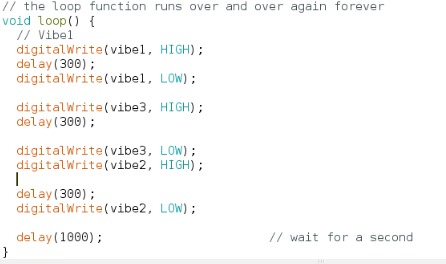 This code was placed in the loop where it would play continuously. Each time an exhale or inhale state starts, a signal is sent over the serial monitor to trigger the simultaneous visual cue to accompany the haptic cue. When the person is inhaling, the vibration monitor vibrates continuously and stops when they are meant to exhale. 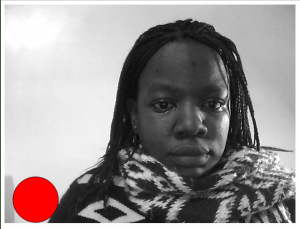 To create the visual cue, I used Processing to read serial monitor values and set states to indicate whether the person is meant to be inhaling or exhaling. 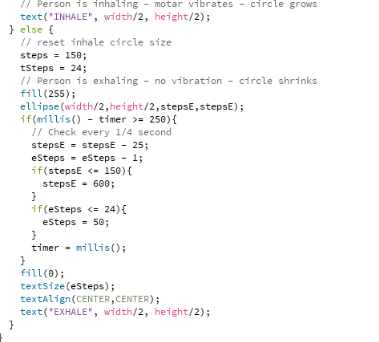 Below is a sample of my code for when a person is inhaling. When the condition is found to be true, the size for the exhale circle is reset to 600 and font size reset to 50 first so that i can maintain a smooth transition between states in the animation to create the circle growing and shrinking effect. When testing, I noticed that the breathing meditation was a little jarring in the transition between exhaling and inhaling and I decided to add a state where the person held their breath. Additionally, I wanted to try using fade in and fade out for the vibrations instead of having continuous buzzing or silence. 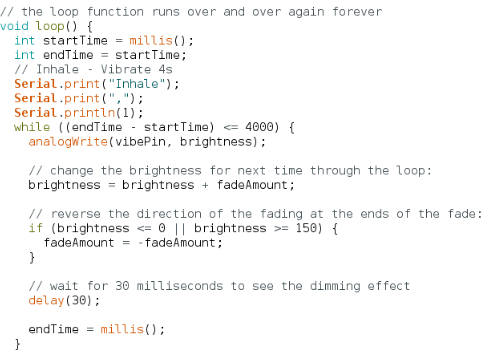 I modified my Arduino code to use analogWrite() in place of digitalWrite() allowing me to create a subtle fade effect. 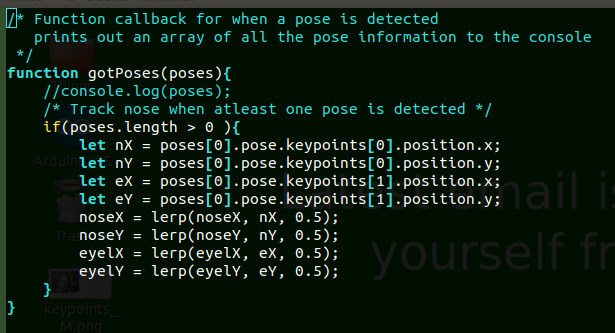 Additionally, on the Processing side, I added a hold state to handle when the person is holding their breath. Project Idea – Wanted to create a wearable stress toy that would distract a user whenever they were feeling anxious. It works by pressing or scrunching up the sensor in one’s hands. This was inspired by self-care and art as a form of therapy / visual meditation. I wanted to create a stress toy for self-care that would distract the wearer whenever they were feeling anxious. When i began ideating, my original idea was to have a plush sensor that could be squeezed and squashed. I then began to think of portability and having the sensor around my wrist but also it not being cumbersome. This led me to thinking of something in the vein of a key-chain, that could be attached or detached onto various items of clothing. My ideal version of this sensor would be a charm bracelet where each charm could be manipulated to produce a different effect distracting the wearer almost like a visual meditation. When the sensor is crushed, pressed, or manipulated sensor values are passed to a recorded. 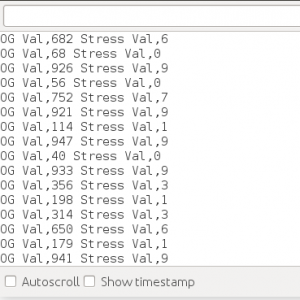 These values are then mapped to a range between 0 and 10 to create a “stressLevel” variable which is later used in a Processing sketch. In Processing, sensor values are used to create a digital painting of circles in a limited color range. The stressLevel value is used to determine what color the circle will be; values closer to 10 are in the blues & violets and values closer to zero are in the reds & pinks. I chose this color scheme to further indicate state of mind i.e when the sensor isn’t being manipulated the painting will be more blue and purple indicating calm and when more reds and oranges are present, this could indicate that the person is agitated or excited. 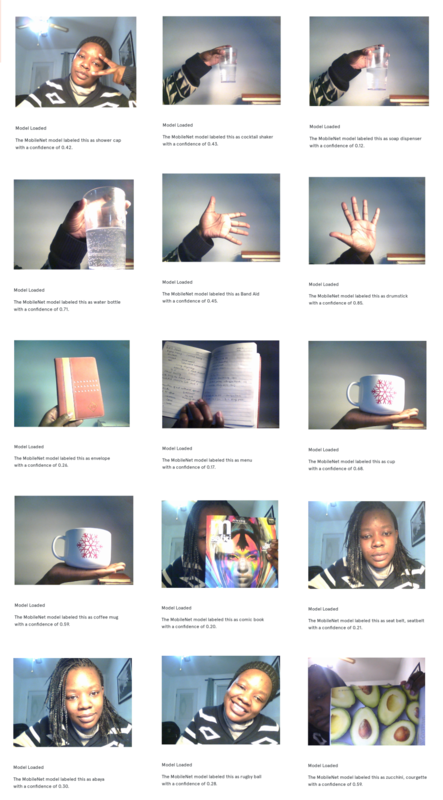 The idea is that by concentrating on manipulating the sensor to create a digital painting, the person is distracted from their anxious feelings. 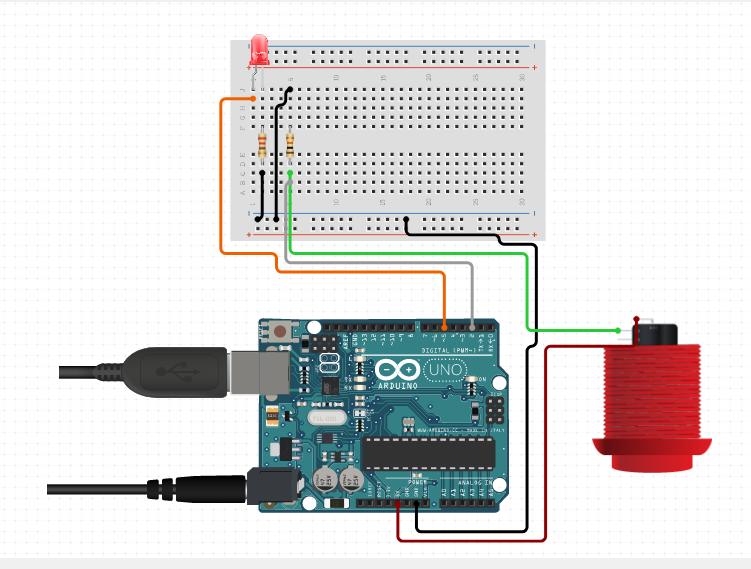 For my variable resistor, I had initially intended to work with the EEonyx StatTex Conductive Fiber but during testing with the Arduino, i noticed that the range for sensor readings was very small and this would not work for me when interpreting how hard a person was clenching their sensor. 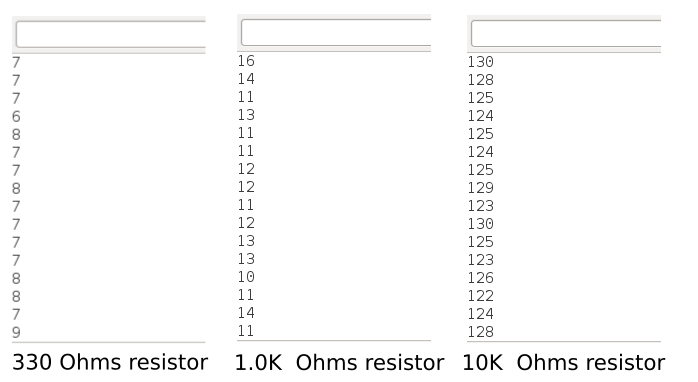 I decided to use the Velostat / Linqstat as it provided me with a wide range of sensor values about 1023 to 0 when tested on Arduino with various resistors. This material was also chosen as it provided a good range of values when crushed, pinched, bend or pressed. 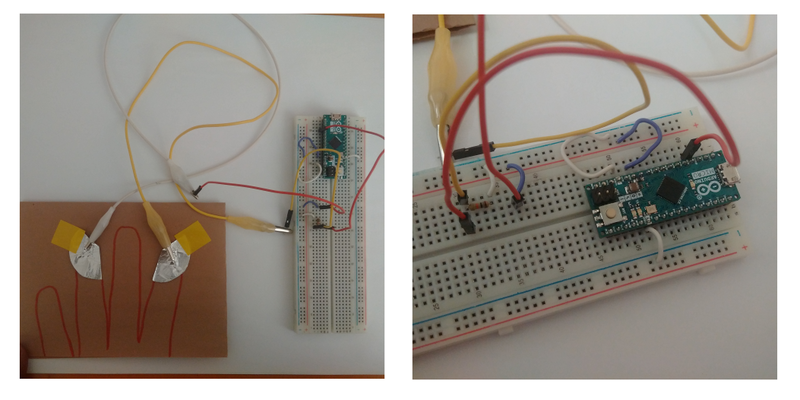 To construct my sensor I used the following materials & tools. Initially I wanted to draw the circles in real-time however, the sensor readings were coming in too fast and this created a very frenetic painting that kind of started giving me vertigo when i stared at it. It was distracting but it seemed to increase my anxiety the longer i stared at the circles moving on the screen. 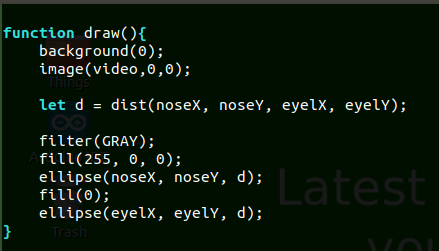 To fix this, i decided to create an array that would hold each circle when it was created and then the draw loop would just pull objects from this array. This seemed to work and also ensured that circles stayed on the screen, thus creating more of a painting than an illusion as with my first explorations. I decided to stay on this route as i had a lot of fun trying to create a painting. I noticed that as the sketch ran longer, the array got bigger and this slowed down the real-time nature of the paintings. The lag between me squeezing the sensor and the appropriate circle showing up got noticeably larger. I tried changing frameRates however this didn’t give me the effect I wanted. 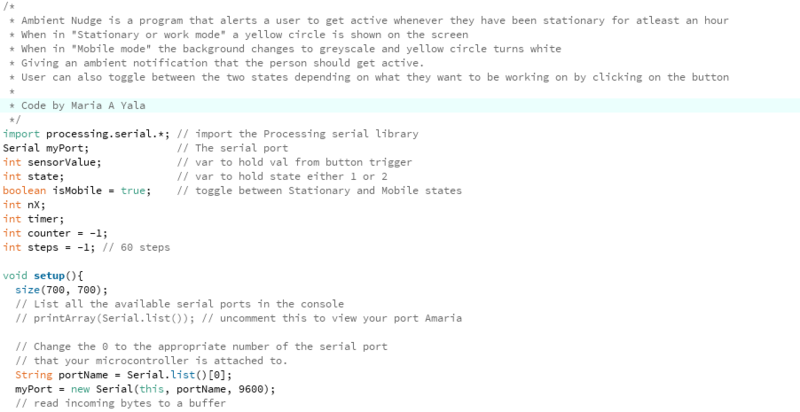 In the end, i decided to modify my for loop so that I would only grab the last 20 readings. In the future, i think it would be better to optimize this loop so that instead of saving all the readings into an array, i could only save a limited amount thus minimizing read times and increasing the real-time response between sensor and screen. I didn’t have enough time to implement this. To improve on SmartCharms i would like to redesign the sensor itself, perhaps making it smaller and more discrete or keeping it at it’s current size but experimenting with different housing for the sensor itself so that i could get softer textures and more flexibility. I’d like to see what the values would be if i used a thinner cover, i.e. removed the neoprene…would the resistance be higher when the sensor is crumpled? I would also like to improve on the visualizations. I was thinking of creating a coloring book type feel where different shapes would be generated on the screen to form a mandala and different parts of it would be colored depending on the sensor reading from squeezing the sensor. How: Sends a distress signal, perhaps with GPS location, when the bracelet is pinched or the badge is pressed. 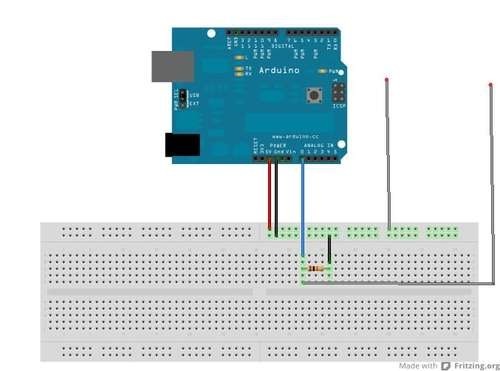 Ideally, the signal would be sent to an application on a phone that would pass the message to a designated party e.g first responders or family and friends. Technique chosen: In the beginning I decided to either knit or weave as I wanted to create a push button controller and a pinch controller. I settled on knitting as I felt that weaving might not work for the push button and may have been too stiff. 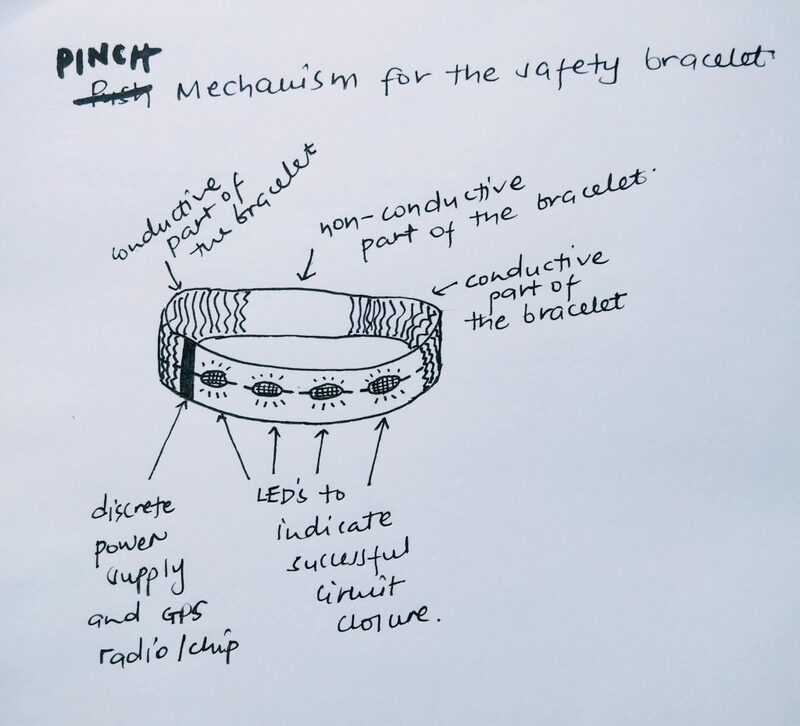 However, now with hindsight, if I were to continue with the idea of a safety bracelet, I would use the weaving technique to create the pinch controller. 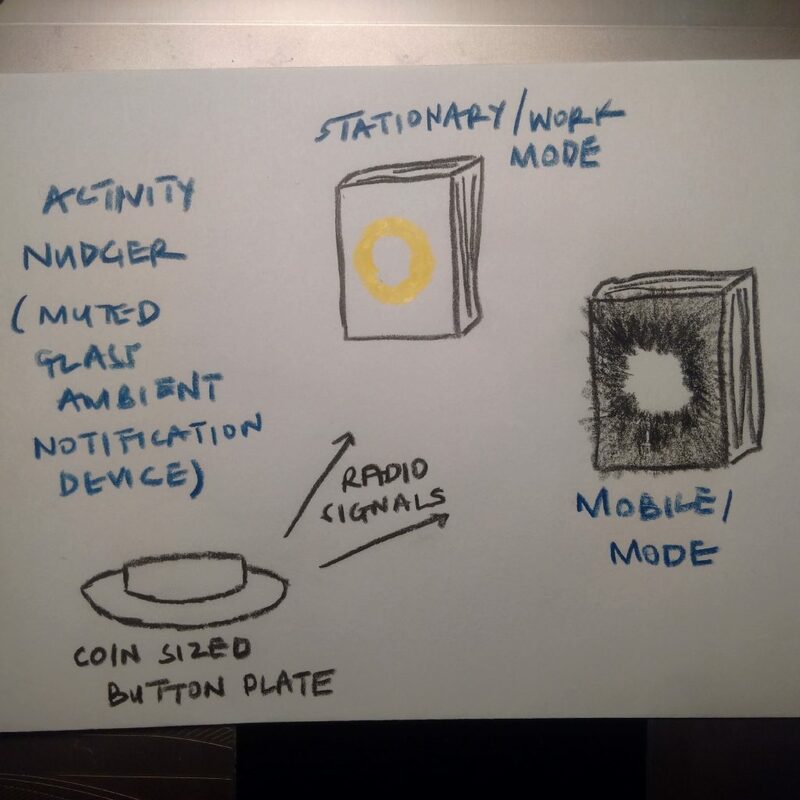 Below is how I envision the push button and pinch mechanism envisioned in a wearable version of the safety badge and safety bracelet. Prepare your materials and cut felt according to the size of badge you want. i.e. This design is for a square badge. Cast-on 10 stitches onto the knitting needle. Begin with your non-conductive piece. Knit in your preferred knitting style. Once you have a square piece, cast-off the stitches to complete the square. You should now have a non-conductive knitted square. 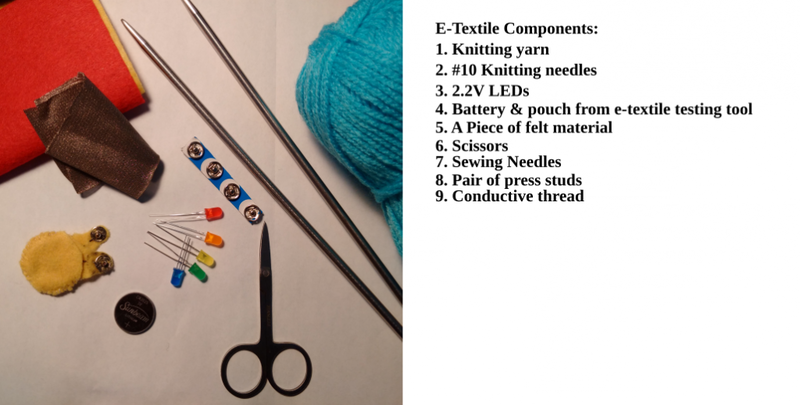 Begin the next square by joining your conductive thread with the yarn to form one thread. Leave a “tail” of at least an inch in length and then cast-on 7 stitches. Knit in your desired style for 7 rows or until you have a square then cast-off. Repeat steps 6-8 to create a second conductive square. Ensure that each square has a “tail”. Sandwich the non-conductive part between the conductive parts and use the e-textile testing tool to test that the push button mechanism works. Tip: Ensure that the stitches on the non-conductive part are loose. 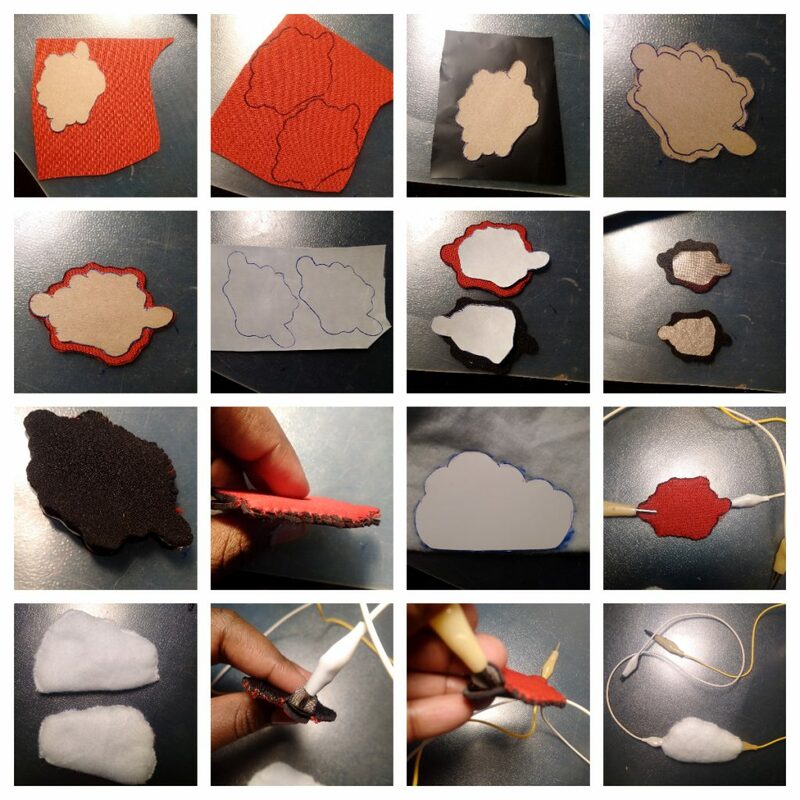 Sew one conductive square to one side of the felt piece. Sew the other conductive square onto the opposite side of the felt piece ensuring that the tails of the pieces are on opposite sides. Pick one side of the felt and sew the non-conductive piece over one of the conductive pieces. Fold over the felt and test the safety badge lights the LED on the e-textile tool. Cut two 1/2 inch wide strips of conductive fabric. 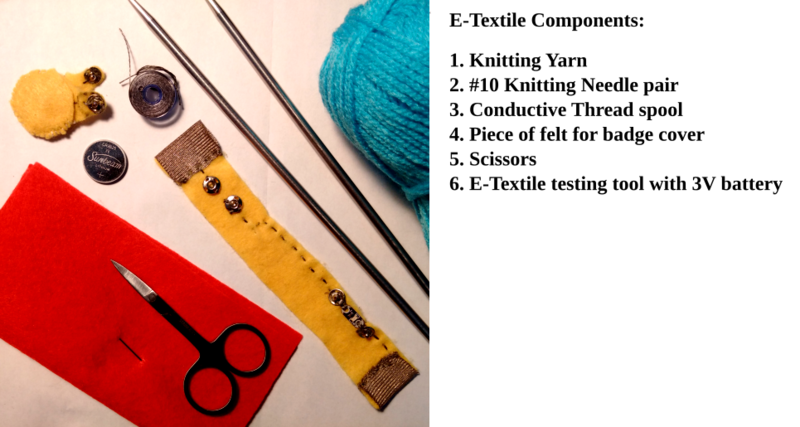 Using an LED and your battery from the e-textile testing tool, designate a + and – side to the strips. String some conductive thread through a press stud and sew a running stitch into the positive side of the conductive strips. Make sure that the press stud fits over the positive side of the battery pack’s press stud. Begin sewing the “legs” of the LEDs onto the positive strip. Sew all 5 LEDs onto the strip and snip the conductive thread when you get to the end of the positive strip or after the last LED has been fastened to the strip. Sew down the LEDs on the negative strip and snip the conductive thread leaving a tail. To create the knitted strip for the pinch circuit begin knitting with a mix of yarn and conductive thread. Ensure that you leave about a 1 inch tail. Knit for about 7 rows and then continue knitting with only yarn. You can snip the conductive thread. Knit with only yarn for 10 rows then attach the conductive thread at the end of a row and continue knitting a new conductive part. Knit for 7 rows and then cast-off and snip the yarn leaving a tail of conductive thread. Attach the tail with yarn and conductive thread mix to the conductive thread tail from the negative strip from step 7. Attach conductive tail end to another press stud that fits over the negative side of the battery pack. Complete the circuit by attaching the battery pack i.e attach the press studs. When you pinch the knitted part, the LEDs should light up. I realized that the blue and green LEDs would not light as the 3V battery did not have enough voltage for the 3.2V bulbs. I switched out the LEDs using red, yellow, and orange LEDs which required 2.2V and all of them lit up as seen in the last picture. 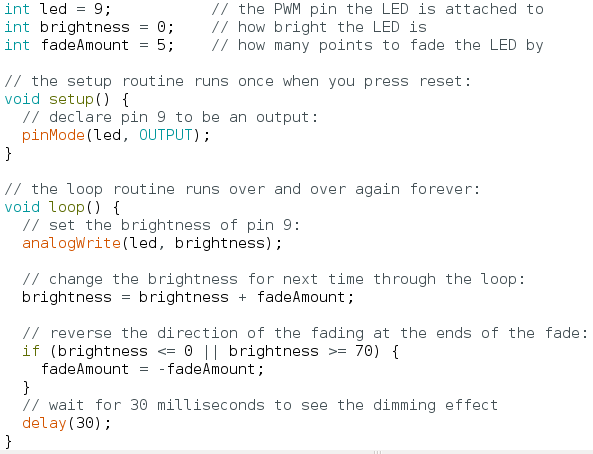 The technique of working with the LEDs and was inspired by this post.